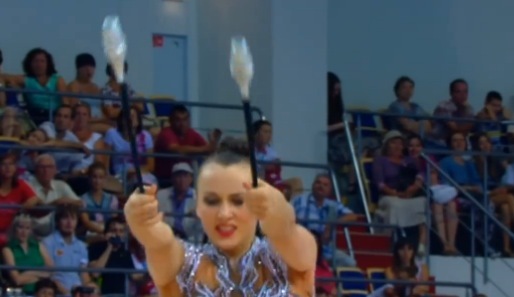 This is a very pretty leotard for Ganna Rizatdinova! Neta Rivkin, on the other hand, held tightly in all routines and beat Staniouta! That 18 score for Ganna has yet to come. This leo is not a favorite, though. I like this gymnast more and more every day. Varvara from Greece! Here she is, with a smile of a queen and the qualities of a Top 8 gymnast! 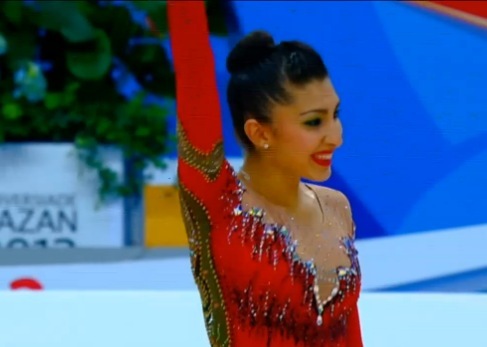 Rita Mamun, the 2013 Summer Universiade champions sparkles with grace, though. I like this girl so much! I love seeing her win. Silviya Miteva, now Mrs. Miteva-Yaneva, didn't make the clubs final but tried to dance to Latin music in red. Talk about cliche. From now on this gymnast is the only one in the world allowed to wear pink and yellow! 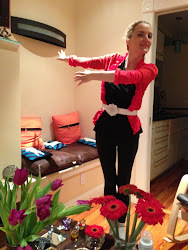 She is rocking it and ribboning it! If you have no clubs technique, you can still "rock" a chicken dance with the clubs under your arms. Many do. And, finally, Ganna is clapping. We need to see that more, and we need more smiles. "Mrs. Miteva-Yaneva, didn't make the clubs final but tried to dance to Latin music in red. Talk about cliche." Miaaow, saucer of milk for Luda! While we're at it, did she wear the blue & orange number as a favour to some 6-year-old niece? Ganna's silver outfit she's so attached to looks a bit gothic and creepy to me, like something out of the Alien movies. Actually I prefer her blue outfit even though it's more ordinary. She has broad shoulders it is better to tame. I think she should be more concerned at the lack of travel around the floor in that ribbon routine. While we're at it I love Durunda's high-neck outfits. I think whoever is helping her with her music and outfits may be a genius. Thank you for your comment! I couldn't agree more about the lack of travel in Ganna's routines, the clubs and ribbon especially, but even the ball could be better. The blue leo? It's fine but it looks like an army uniform to me. I like her better in softer colors. Her ball leo from last season was very pastel-toned I loved it. About Durunda, she is obviously very beautiful but the same can be said of other gymnasts and they still manage to wear weird (at best) leotards. You are right that whoever is helping Durunda has found the right measure of "unique" without going into "creepy."